Recent advances open up treatment for deep tissue conditions, mental illness and neurological diseases. Important advances in our understanding of the basic science of photobiomodulation are influencing the development of laser technology and the use of these devices to treat a number of diseases and injuries. Photobiomodulation (PBM) is the mechanism by which non-ionizing optical radiation in the visible and near-infrared (NIR) spectral range is absorbed by endogenous chromophores to elicit photo-physical and photo-chemical events at various biological scales. Figure 1. A smart, tissue-activated optical fiber probe is inserted below the skin into sequential tissue layers through a hypodermic needle. The light source is positioned above the skin for transcutaneous application of light. Courtesy of Dr. Juanita J. Anders. Photobiomodulation Therapy (PBMT) is a form of light therapy based on the principles of PBM. It involves the use of non-ionizing forms of light sources including lasers, LEDs and broadband light, in the visible and NIR spectrum to cause physiological changes and therapeutic benefits1. The current advances in PBM are providing solid justification for the development of effective PBMT technology. An important advance in PBMT was the recognition that optimization of transcutaneous therapeutic parameters should be based on the photonic dose reaching the target tissue2,3 and that requires higher doses of light at the skin surface. Historically, the treatment parameters used for PBMT were based on Endre Mester’s initial reports that a dose of 1 J/cm2 from a ruby laser caused significant stimulation of healing of cutaneous wounds and burns in a mouse model. In his in vitro and animal experiments, Mester tested the effects of fluences ranging from 0.05 to 4.0 J/cm2 and reported that these fluences were effective4,5. A review of the literature on in vivo rodent wound studies determined that use of red or NIR wavelengths at a range of fluences with a median of 4.2 J/cm2 resulted in significant improvement in cutaneous wound healing6. However, when clinicians began to use PBMT to treat tissues located deeper in the body, they persisted in using these low fluence parameters that were not appropriate for translation to deep tissue treatment. The outcome was publication of negative results, which led to the conclusion that there was inadequate evidence to recommend PBMT for clinical use7. It is now obvious that these negative studies were due to incorrect device and treatment parameters8. Recent studies, for example, determined the output power of an 808-nm wavelength laser required to deliver different fluence rates to the level of the sciatic nerve in an anesthetized rat. Fluence rates were measured using a customized NIR detector from B&W Tek Inc. of Newark, Del. For output powers of 3, 5 and 10 W (the maximum output power), the fluence rates were 80 mW/cm2, 165 mW/cm2 and 270 mW/cm2, respectively. The basis for this experiment was published data on the mechanistic basis of pain suppression due to microtubule disruption and suppressed conduction velocity with irradiances and fluence rates ranging from .3 to 1.73 W/cm2. These findings indicate that inhibition of nerve conduction and pain suppression requires comparatively high therapeutic doses9,10. For treating target tissue in the depth of the body, the wavelength of light governs its depth of penetration into a tissue. Both absorption and scattering coefficients of living tissues are higher at shorter wavelengths; NIR light penetrates more deeply than red light. A 2005 experiment examined the transcutaneous light penetration to the level of the spinal cord in adult anesthetized Sprague-Dawley rats11. Researchers applied an incoherent, broadband, white light to the surface of the skin over the thoracic vertebrae (Figure 1). A tissue activated optical fiber probe sequentially collected transmission spectra in the range of 500 to 1200 nm at various depths in the body to the level of the spinal cord. Figure 2. Light transmission measured using a tissue-activated optical fiber probe was highest through all tissue layers and blood between the 770- and 850-nm wavelengths, with a peak at 810 nm. The graph shows the sequential insertion of the probe to five different layers that include the subcutaneous connective tissue layer, the deep connective tissue layer, muscle, and the spinal cord within the vertebral column. At each layer, a transmission spectrum in the range of 500 to 1200 nm was collected while white light was applied to the skin surface. Courtesy of Dr. Juanita J. Anders, USUHS, and Dr. Ilko Ilev, FDA. Analysis of the transmission spectra revealed that the range of penetration was highest through all tissue layers overlying the spinal cord and through blood between the 770- and 850-nm wavelengths with a peak at 810 nm (Figure 2). The 810-nm wavelength was minimally absorbed by blood and water. These data demonstrated that 810-nm wavelength light is within the optimal range for light penetration to tissues deep in the body. 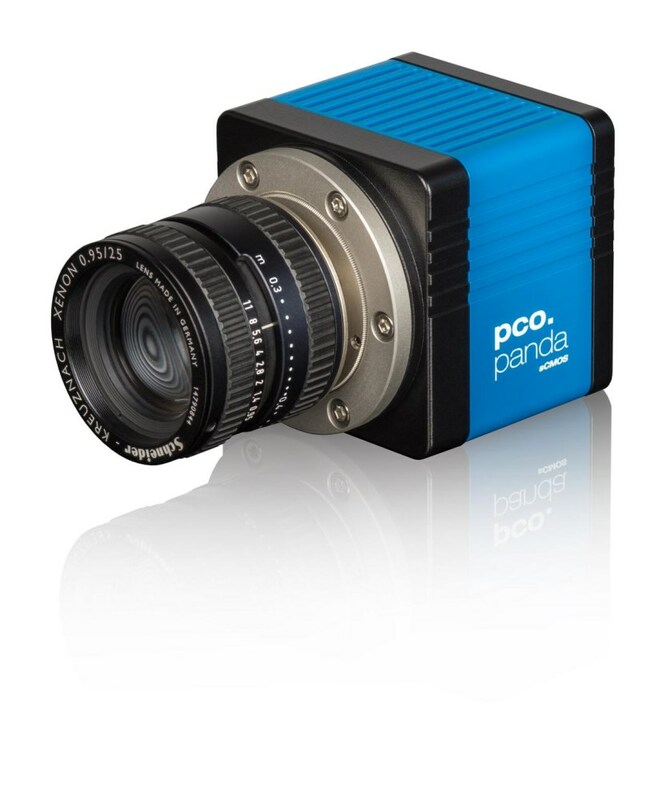 A common experimental flaw in many laboratories investigating PBM applications is to have a set of effective laser parameters for one wavelength and to use these same parameters for a different wavelength. A series of experiments from my laboratory examined the cellular effects of 980- and 810-nm wavelength light on in vitro human fibroblasts. At an irradiance of 10 mW/cm2 and a fluence of 5 J/cm2, 810-nm wavelength light caused an increase in mitochondrial metabolic activity, while 980-nm wavelength light at the same irradiance and fluence inhibited mitochondrial metabolic activity (Figure 3). In in vitro cortical neurons, 980-nm wavelength light at 10 mW/cm2 and lower energy densities supported neurite elongation, while 810-nm wavelength light at the same irradiance and fluence had no effect. These data demonstrate that for a given irradiance, 980-nm wavelength light altered cellular activity at lower energy densities compared to 810-nm wavelength light. Thus, for different wavelengths of light at a given irradiance, the fluence necessary to achieve a desired effect may be very different. Figure 3. In a study of the cellular effects of wavelength light, mitochondrial metabolism of in vitro human fibroblasts was measured by the MTS assay. The fibroblasts were either not treated (control) or treated with 810- or 980-nm wavelength light. The data were normalized to the control data. For the range of energy densities investigated, 810-nm wavelength light at an fluence of 5 J/cm2 caused a statistically significant increase in mitochondrial metabolism. Over the same range of energy densities, 980-nm wavelength light caused a statistically significant decrease in mitochondrial dehydrogenase activity for all energy densities tested. P<0.001. Bars represent the mean, and the error bars represent the standard error of the mean. Courtesy of Dr. Juanita J. Anders. Although Class 3 lasers have been used successfully for PBMT for years, the current trend in PBMT is increased use of Class 4 lasers. Clinicians need the higher output powers to deliver appropriate doses of light to treat deep tissue conditions, especially pain. The FDA cleared the first PBMT Class 4 laser device, the Avicenna Laser, in 2003. It had an output power of 7.5 W and wavelengths of 660 (aiming beam) and 980 nm. The intended use was for promoting relaxation of the muscle tissue and temporary relief of minor muscle and joint pain, muscle spasm, pain and stiffness associated with arthritis. The Class 4 K-laser LLC received FDA clearance in 2005 and the Class 4 LiteCure LLC in 2007. There are now at least 10 Class 4 devices on the market. The efficacy of a Class 4 laser for musculoskeletal injuries (MSI) was demonstrated in a recent article on treatment of MSI at an on-site physical therapy program at Zellstoff Celage Ltd., a Canadian pulp mill that is one of the largest single-line Kraft pulp mills in North America12. In 2015, the company added PBMT to its on-site physical therapy program to determine if it could provide a measurable impact on incidents of MSI. Figure 4. A Canadian pulp mill used this Lite Cure LLC laser model LCT-1000 with 10-W output power for a study of Photobiomodulation Therapy (PBMT) that resulted in a decrease in workers’ compensation for musculoskeletal injuries. Courtesy of Dr. Brian Pryor, CEO, LiteCure LLC. The Class 4 device had an output power of 10 W and wavelengths of 980 nm (80 percent) and 810 nm (20 percent) (Figure 4). Although the clinical findings were mostly anecdotal, analysis to determine return-on-investment for PBMT for MSI was impressive. The compiled data showed that in the 12 years prior to including PBMT at the clinic, the average number of workers’ compensation claims for MSI was 35.17 per year. During the year following the addition of PBMT, this number dropped to 12 and saved the program an estimated half a million dollars. A novel area of PBMT that has generated a great deal of interest is Transcranial Photobiomodulation Therapy (TPT), which is defined as the noninvasive delivery of NIR light to the brain for the treatment of acute brain injuries, chronic neurological diseases and mental illnesses. The hypothesis that light can have a profound effect on the nervous system is supported by a large body of literature. Studies of the photobiological effects of NIR light on cultured neurons demonstrate transcription factor activation, expression of prosurvival proteins, and improved function, while pre-clinical studies on animals show neural protection, nerve regeneration and functional recovery. Figure 5. The graph depicts 808-nm wavelength fluence rate measurements in the human brain for a typical coronal section at each of nine individual isotropic detector probes. We collected measurements serially at 5-mm depth intervals of brain tissue. Each data point represents a mean of data collected over several seconds while the primary laser was activated and the light intensity data was collected at a rate of 7 points/seconds. The data were normalized to 1 W at the external surface of the scalp. Courtesy of Dr. Juanita J. Anders, USUHS, and Clark Tedford, Lumithera Inc.
NIR light can penetrate through the scalp, skull, meninges and brain. Light penetration measurements on human, unfixed cadaver heads demonstrated that 808-nm wavelength light penetrated to a depth of approximately 40 mm for all cortical areas tested (Figure 5)13. On 25-mm-thick brain slices, cortical sulci acted as waveguides with light penetrating into the brain along these spaces (Figure 6). Recently, TPT has been shown to alter cerebral hemodynamics and oxygenation in the human brain in vivo using functional NIR spectroscopy. 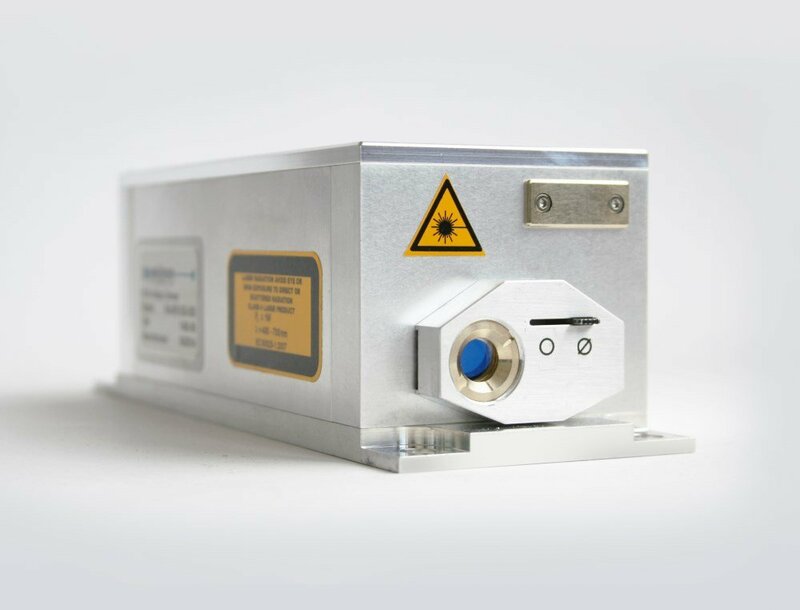 A 1064-nm laser was used at an output power of 3.4 W and an irradiance of 0.25 W/cm2. The laser was placed on the center or on the right side of the forehead and treatment lasted for 10 minutes. In both experiments, TPT induced an increase of oxygenated hemoglobin concentration and a decrease of deoxygenated hemoglobin concentration in both cerebral hemispheres14. Figure 6. This infrared camera photograph of a 25-mm slice of fresh human cadaver brain shows 808-nm wavelength light penetrating into the brain along the sulci as well as through the brain tissue. Courtesy of Dr. Juanita J. Anders. There is great interest in using laser TPT for the treatment of depression. A proof of concept, prospective, double-blind, randomized study of NIR laser treatment on six patients with major depressive disorder administered TPT to the forehead bilaterally at four sites total. The study used a GaAlAs laser, with an 808-nm wavelength with an output power of 5 W, an irradiance of approximately 700 mW/cm2 and a fluence of 84 J/cm2. Preliminary data showed that post-treatment depression ratings were significantly reduced from baseline, and that the treatment was well tolerated15. A large clinical trial is now being planned. Juanita J. Anders, Ph.D., is a professor of anatomy, physiology and genetics at USUHS in Bethesda, Md. She is director of the Photobiomodulation Technical Group of The Optical Society of America; email: juanita.anders@usuhs.edu. The opinions and assertions contained herein are solely of the author herself and are not to be construed as official or reflecting the views of the Department of Defense, Uniformed Services University of the Health Sciences. 1. J. J. Anders, et al. (2015) Low-level light/laser therapy versus photobiomodulation therapy. Photomed Laser Surg, Vol. 33(4), pp. 183-184. 2. J. J. Anders, et al. (2014) In vitro and in vivo optimization of infrared laser treatment for injured peripheral nerves. Lasers Surg Med, Vol. 46(1), pp. 34-45. 3. R. Weersink, R. White, L. Lilge, editors (2007) Light dosimetry for low-level laser therapy: accounting for differences in tissue and depth. Proceed SPIE, February 21. 4. E. Mester, et al. (1971) Effect of laser rays on wound healing. Amer Journal Surg, Vol. 122(4), pp. 532-535. 5. E. Mester, et al. (1985) The biomedical effects of laser application. Lasers Surg Med, Vol. 5(1), pp. 31-39. 6. P. Peplow, et al. 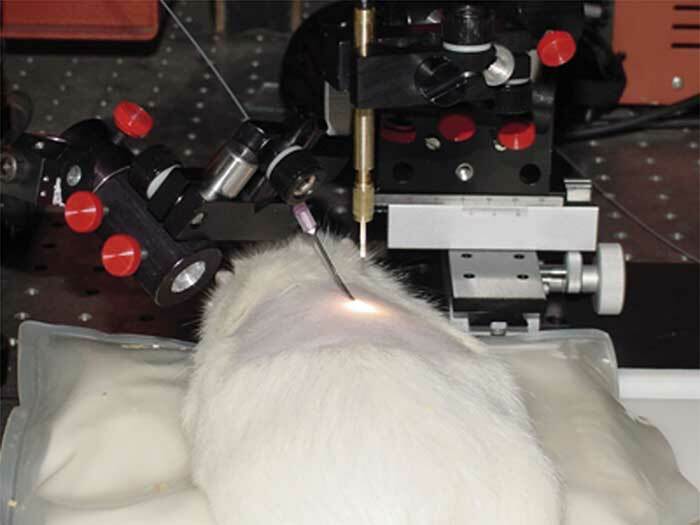 (2010) Laser photobiomodulation of wound healing: a review of experimental studies in mouse and rat animal models. Photomed Laser Surg, Vol. 28(3), pp. 291-325. 7. J.R. Basford (1995) Low intensity laser therapy: still not an established clinical tool. Lasers Surg Med, Vol.16(4), pp. 331-342. 8. J. Tuner and L. Hode (1998) It’s all in the parameters: a critical analysis of some well-known negative studies on low-level laser therapy. J Clinical Laser Med Surg,Vol.16(5), pp. 245-248. 9. R.T. Chow, et al. (2007) 830 nm laser irradiation induces varicosity formation, reduces mitochondrial membrane potential and blocks fast axonal flow in small and medium diameter rat dorsal root ganglion neurons: implications for the analgesic effects of 830 nm laser. JPNS, Vol. 12(1), pp 28-39. 10. R.T. Chow, et al. (2011) Inhibitory effects of laser irradiation on peripheral mammalian nerves and relevance to analgesic effects: a systematic review. Photomed Laser Surg, Vol. 29(6), 365-381. 11. K. R. Byrnes, et al. (2005) Light promotes regeneration and functional recovery and alters the immune response after spinal cord injury. Lasers Surg Med, Vol. 36(3), pp.171-85. 12. J. Summersides and D. Roberts (2016) Fit for duty: Laser therapy reduces musculoskeletal injury rates at a Canadian pulp mill. ADVANCE for Phys Therapy & Rehab Med. Vol. 27(12), pp. 20-21 www.advanceweb.com/pt. 13. C.E. Tedford, et al. (2015) Quantitative analysis of transcranial and intraparenchymal light penetration in human cadaver brain tissue. Lasers Surg Med, Vol. 47(4), pp. 312-322. 14. F. Tian et al. (2016) Transcranial laser stimulation improves human cerebral oxygenation. Lasers Surg Med, Vol. 48, pp. 343-349. 15. P. Cassano, et al. (2015) Near-infrared transcranial radiation for major depressive disorder: Proof of concept. Psychiatry J, Vol. 215, ID352978, pp. 1-8.